Jade plants are a mainstay in my plant collection, and they are one of my favorite indoor plants! They are easy to care for succulents, and they make great houseplants. There are several different types of jade plants too, I have four in my collection (and I love every one of them!). 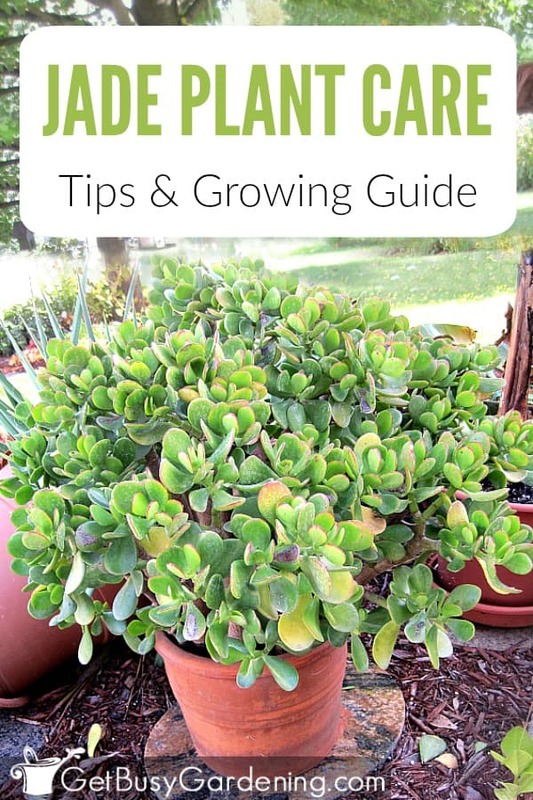 I get tons of questions from readers asking for details about how to grow a jade plant, so that’s why I wrote this post! The great news is that no matter what varieties you’re growing, the care instructions are the same. Keeping these gorgeous plants thriving for years to come is easy with these detailed jade plant care tips. Like I mentioned above, there are lots of different types of jade plants, and I grow a few myself. In addition to the common jade plant (crassula) variety, I have the ‘Gollum’ variety which has really cool leaves that are long, narrow and rounded. I’ve also heard this variety of jade plant called E.T. fingers or baby toes. I have a dwarf jade succulent too, which is perfect for growing in my miniature indoor succulent garden (this one didn’t have a tag when I got it so I’m not sure of the variety). It looks very similar to the regular one, but it’s much smaller (as the name would suggest). The other type of jade plant I have is called ‘Jitters’, and it has wavy leaves. In my experience, the two main keys to successfully growing jade plants indoors are jade plant watering and light. Below I will discuss both how often to water a jade plant, and how to water a jade plant. Then I will give details about jade plant light requirements, and also answer your questions about how much light does a jade plant need. One of the most common questions I get is “how often do you water a jade plant?“. First, and probably the most important jade plant care tip is watering – they do not like to be over watered. Consistently over watering jade plants will kill them. If the plant is over watered on a regular basis, it will start to rot at the base. So, always be sure to always check the jade plant soil before watering it, and water only when the soil is completely dry. To check if your jade succulent needs water, stick your finger one inch into the soil. If the soil is damp, don’t water it. You could also use a soil moisture gauge to help you monitor the moisture level. It’s better to err on the side of under watering this plant. I put my jade plants outside during the summer and only water them if we’re in a drought. During the winter, I water my jade plants about once a month, if they need it. As for how to water a jade plant, simply pour water into the top of pot until it starts to drain out the holes in the bottom of the pot. Be sure to allow the water to drain completely, and always empty the drip tray or cache pot. Never allow the pot to sit in water. Another very common question I get asked by readers is “how much light do jade plants need?“. So, the second most important indoor jade plant care tip is light. Do jade plants need a lot of sunlight? Yes, you bet they do! Jade plants need a lot of light in order to grow strong and thick. They will start to grow weak and leggy if they aren’t getting enough light. To avoid a leggy jade plant, you’ll want to give it as much light as possible. It’s best to place jade plants next to a south facing window inside the house. If the plant isn’t getting enough light, consider adding a grow light. Indoor plant grow lights will help to give your jade plant enough light to thrive if you don’t have a sunny window to put it in. 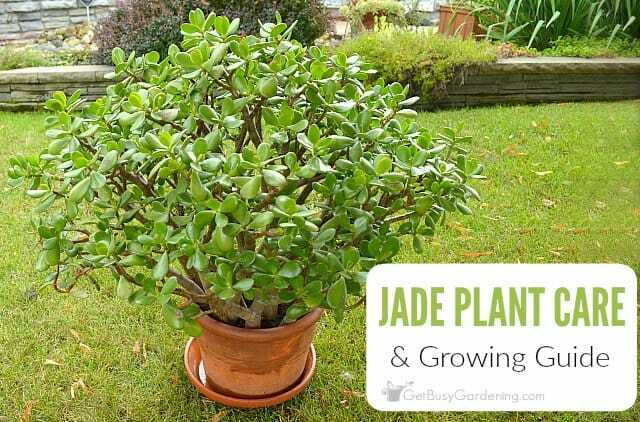 When jade plants get enough sunlight, the stem of the plant will grow thick start to look woody. Also, the leaf tips of the jade plant will turn red, making these plants even more beautiful. Jade plants kept as houseplants will benefit from being moved to a full sun location outside during the summer. However, they are sensitive to sunburn, so it’s important to move them into the sun gradually over several weeks. Sun burned leaves will turn brown and the damaged area will die; most likely the leaf will eventually drop off. Severe sunburn may be fatal to jade plants. If you put your plant outside during the summer, be sure to bring it back inside before any chance of frost. Like I said, water and light are the two most important things to pay attention to when it comes to successfully growing a jade plant indoors. But, caring for a jade plant is a bit more involved than just those things. 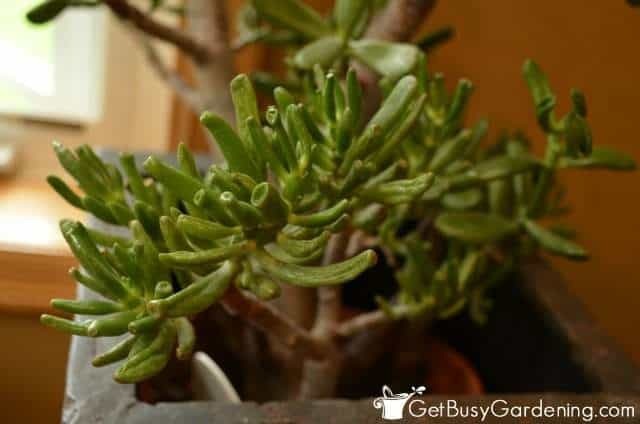 So here are even more tips for how to take care of a jade plant that will help your plants not only survive, but thrive (and live for years to come)! General potting soil is adequate for growing jade plants, but sometimes regular potting soil can hold too much moisture. 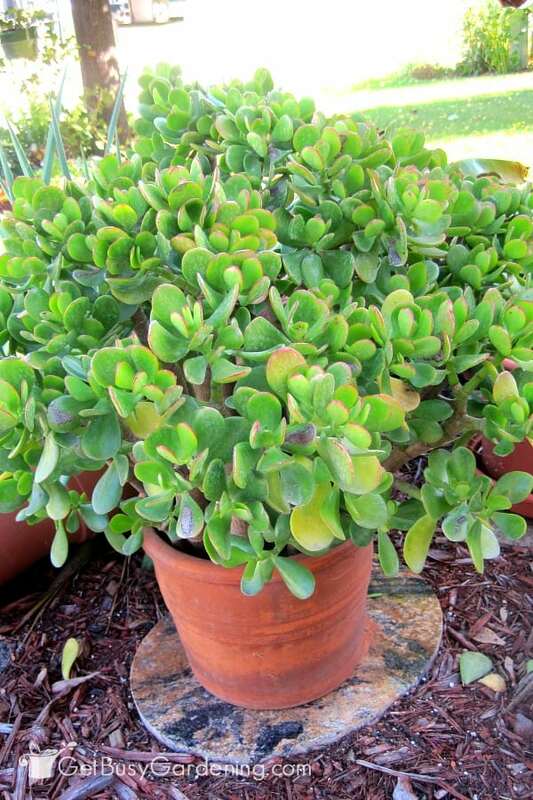 The best soil for jade plant is a porous and quick draining succulent soil. You can buy succulent soil online, or anywhere general potting soil is sold. I make my own succulent soil mix, using a light mix of coarse play sand, potting soil and perlite. The best pot for jade plant houseplants is a clay pot, especially if you tend to overwater your plants. Clay pots will help to wick the water out of the soil, allowing it to dry out faster and lowering the chance of over watering. Whenever I post a photo of a jade plant blooming on social media, I get a ton of comments on it from people who had no idea that jade plants bloomed! It’s funny, because when you travel to the south during the winter, you see jade plants blooming all over the place. But here in the north where we have to grow jade plants indoors, it’s very rare to see a jade plant flowers! In order to get your jade to bloom, you need to give it similar conditions to what it experiences when it’s grown outdoors. The trick is to expose it to cooler (but never freezing!) temperatures, allow the soil to dry out, and make sure it gets tons of light! I’ve had luck getting mine to bloom after bringing it indoors (by accident the first time!). I used to bring it in as soon as the heat of summer was over, but now I leave my jade outside until right before our first frost in the fall. Then I bring it inside, put it in a sunny spot, and allow the soil to dry out. That usually does the trick! Jade plants are extremely easy to propagate. They can be propagated from stem or leaf cuttings in slightly moist, well drained soil. I have found that summer is the easiest time for jade plant propagation. During the summer, many times a leaf will break off and start to grow roots in the soil without any help from me. If the stem of your jade is mushy and rotting due to over watering, you can save the plant by cutting off the stem a few inches above the rot, and then propagating it. Allow the cut area to dry for a few days before attempting to propagate the plant. Dipping the cutting in rooting hormone helps to speed up the process of propagating jade plants (and all plant cuttings), I highly recommend it. If you want to learn more about how to propagate your jade, then check out my detailed, step-by-step jade plant propagation instructions. Jade plants will definitely benefit from being fed now and then, just like any other plant. But there are a few things you’ll want to keep in mind. First, don’t fertilize them during the fall and winter months, they go into a dormant state during the winter and you don’t want to force new growth. Also, make sure the jade plant soil is moist before you add any houseplant fertilizer. If you add fertilizer when the soil is completely dry, you can damage your plant. Water it first, then give it some liquid fertilizer. And make sure you use an organic plant fertilizer on your jade plant. Chemical fertilizers can build up in the soil and damage sensitive plants. To make it super easy to fertilize, you can buy succulent plant food specifically made for fertilizing cactus and succulent plants. If you prefer something more general purpose, I recommend using a compost fertilizer. You can use a pre-made compost tea, or you can buy compost tea bags and brew your own. Fish emulsion and liquid kelp are also fantastic liquid fertilizers, but should only be used on outdoor plants (they can get a bit stinky when used indoors). With proper jade care, your plant will grow healthy and strong. Healthy jades don’t usually have problems with pests, so hopefully you’ll never see any bugs on your jade plant. Mealybugs, houseplant scale and spider mites can become a problem on jade plant houseplants if not treated early. My largest jade had a minor infestation of mealybugs one winter. I treated it by dabbing a cotton swab in rubbing alcohol, and using that to remove the bugs (you can use the same treatment for other jade plant bugs as well). After several weeks of doing this daily, the mealybugs were gone and I haven’t had a problem since. Neem oil is also very effective at controlling houseplant pests. When my small jade was attacked by mealybugs, I used neem oil to get rid of them, and it worked like a charm. Organic insecticidal soap or a horticultural oil spray can also help to control houseplant pests. Be careful spraying anything on your jade though. Jade plants are sensitive to sprays, which could end up causing more damage than the bugs. If you choose to use a spray to treat a pest infestation, test a small area of the plant first, then wait a few days to make sure there’s no damage before spraying the whole plant. 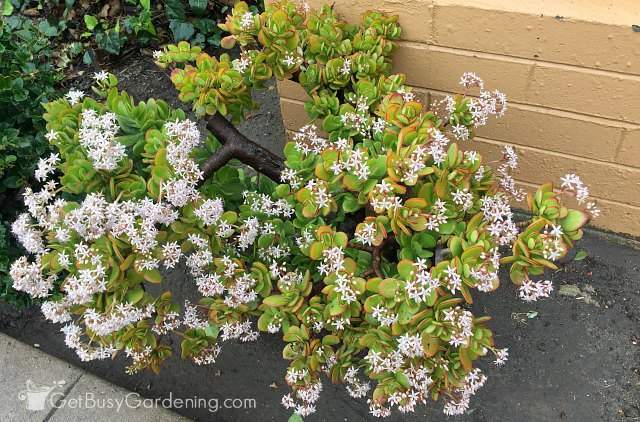 Pruning is another important part of regular jade plant care. Regularly trimming your jade will keep the plant compact, and allow the stem to grow thicker. Pinch off new growth or prune off leggy growth to encourage the plant to grow fuller and thicker. Be sure to use a sharp pair of pruning snips for the job, or get yourself some bonsai pruning shears. If you want, you could use the cuttings you trim off your jade plant succulent to make new plants (see the propagation section above). Jade plants are one of my favorite houseplants. They are low maintenance indoor succulent plants, easy to take care of, and they’re beautiful too. There are several varieties of jade plants, and it’s fun to collect them. If you follow these jade plant care tips, you’ll have no problem keeping your plant alive and thriving indoors! If you struggle to keep your beloved houseplants alive during the long winter months, then my Winter Houseplant Care eBook is for you! It has everything you need to keep all of your houseplants thriving all year long! Download your copy today. Share your jade plant care tips in the comments section below. 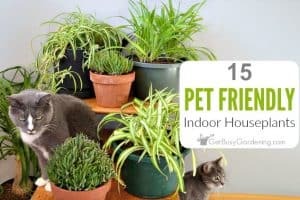 Good site.I just brought a Jade plant red tipped.I have had one before,but really did not know how to care for them I learned alot on this site!! !Thank's again. I believe your other variety of jade the one you call dwarf, may be a baby jade. I have one of those and a wandering jade that has large flat leaves that grow out on arms and a regular old jade. Your plants are beautiful and your advice is awesome. My mom has had her jade plant for over 15 years and it just bloomed last Christmas. It was amazing! We live in the south and her jade gets to live outside during the summer and we’ve never seen or heard of one blooming. I love plants and gardening so very much! Yes, I call it a baby jade too. 🙂 I’ve never heard of a wandering jade before. Sounds interesting, I’ll have to look that one up. Wow, it’s so cool that your mom’s jade plant bloomed!! So much fun! Thanks for your nice comments about the post too. You made my day! My jade has a fungus on the leaves. Any suggestion? If fungus is growing on the leaves of your jade plant, then that means it’s getting too much moisture. Allow the plant to completely dry out, and never water over the top of the leaves. If possible, move it to a spot where it’s gets better air circulation, and the leaves won’t get wet very often. We have a 40+ year old jade TREE. We have moved several times and don’t have room in our new house!! It is as big as a chair! We have MANY daughters from this plant, and have given many more away. These plants are profuse! 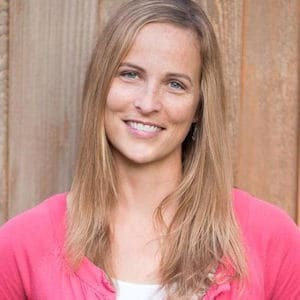 Great tips on care; any tips on Jade Foster homes, or Nursing homes I should say? I too have a 40 year old JADE. It out grew being a house plant. I put in my small greenhouse, it got so big it was touching the roof and wider than the doorway. I built an 8 x 10 foot greenhouse just for it. Now has a permanet home and is the star in there. Love jades and have had one all my life. Would be rather sell the car than lose my jade. my jade plant is lousing leaves it has a web I tried to spray with bug spray and wash it with dawn dish det. mixed with water it does not look good is their you could tell me ? Sorry to hear your jade plant is suffering. You definitely don’t want to use a detergent soap on succulent plants. I’m guessing that’s what caused the damage. The best you can do at this point is to leave it alone and hope it recovers. You could try trimming off a few of the heavily damaged leaves, which might help to encourage new growth – but don’t trim off all the leaves! Hope it will recover for you! Would love to see it! Would love to have some. Definitely gonna have to go out and get one, or ask around. Could you please tell me what is the best storage container or “whatever” to keep store bought or home made potting soil in ? I can’t seem to find anything at all that is AIR TIGHT. I bought one of those simple large storage containers from Walmart but every time I checked, there were always all sorts of little critters in there and stuff so this was most definitely NOT AIR TIGHT !. I live in Eastern Coastal Florida in a quite rural subdivision and we have alot of woods, canals, etc., but not alot of neighbors and that’s the way we like it. However, it seems to me that the more wooded area you live in, the more creatures that you have to deal with !! I don’t mind any of them because I’m only referring to spiders, some bugs, frogs (all kinds), lizards which are adorable because I have never seen so many, and I do mean – TEENINEY little lizards. The like to sleep and live in my snake plants. I am having a problem finding something that is truly AIR TIGHT that is not so expensive that I can’t afford it. I have alot of store bought Potting Soil now that I am keeping in the house because of the humidity outside and yes, even in January. However, again I’d like to make my own for jade plants, which I also ADORE as you have listed here. Any suggestions would be greatly appreciated because either my brain has shut down or I simply just cannot think of anything. All of the “so called” air tight containers that I have bought from Walmart DO NOT KEEP OUT ALL OF THESE LIL CREACH-TURES THAT LIVE AROUND HERE WITH ME !! I use 5 gallon buckets with tight fitting lids to store my potting soil. I reuse the buckets that my cat litter comes in – the big yellow Tidy Cat buckets. See if any of your friends have cats and will give you the buckets. I’m always giving my extra cat litter buckets away on Craigslist, so check your local Craigslist to see if you can find free ones there. Otherwise, you could buy a 5 gallon bucket with a lid from the home improvement store for pretty inexpensive. Hope this helps. It is possible that many of your bugs are hatching from eggs already present in some of the soil you are using. Either way, I purchased a BLACK covered plastic (ABS) Rubbermaid trash container to mix and store my soil in. if you place it in a sunny location, the interior temperature will rise to intolerable levels for any insect to survive in. If you prefer a smaller container, use the advice here and use a 5 gallon pail only paint the exterior black and be sure to place it where it will get some direct sun light. This will definitely eliminate the bug problem. Great advice Terry, thanks for sharing! I would consider buying 5 gallon buckets with the Gamma Seal Lids. These type of seal lids screw on and off and are used in long term storage of dry food that keep the foods air tight and free of bugs. Hello! I have a jade plant that seems to have ‘fainted’ for lack of a better term. Instead of growing up it’s just spilling over the sides of the pot. I moved it outside and the leaves are getting red edged, but it’s still sorta flat and not upright. Any ideas on what’s going on? When taking stem cuttings, because of the problemErika is having, how large of a stem can be used as a cutting. Mine has also grown downward. Now, because I will have to move it back outside, it’s at risk of stem breakage. Can I let any stem dry out and reroot? Also, I would like to put it in a larger pot and I’m sure some of it will break off. Will these stems re root? Thank you! Love your jade insight! Yes, you can use any sized stem for a cutting – and any pieces that break off your plant when you repot it can be rooted as well. 🙂 The larger the stem, the longer you should allow it to dry out before you trying to root it. Aren’t jade plants awesome!? But now each one has dropped their leaves! That gets south afternoon somewhat filtered sun. Trimming it all back. Pot is fairly small & ceramic. I need your help to make certain all three of our plants survive as they have special meaning! First, check the soil and make sure it’s not wet. If the soil is wet, you can pull the plant out of the pot to allow it to dry faster, or just let it dry out before watering again. In the future make sure to allow it to dry out completely between watering (and ensure the pot has a drainage hole in the bottom). Also check the base of the plant (near the soil line) and make sure it’s not mushy. 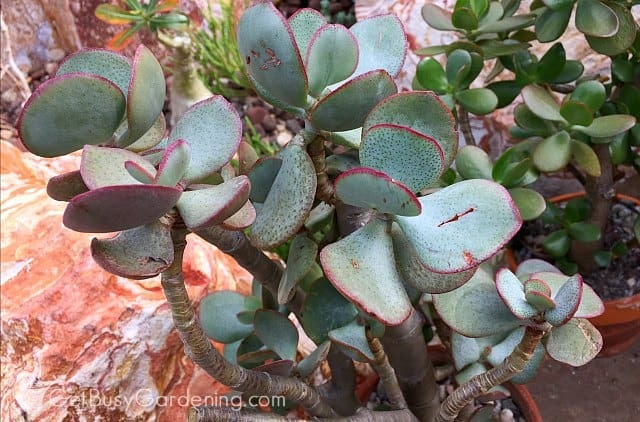 If the base of the plant is mushy and rotting, you may still be able to save it by taking cuttings and propagating them (how to propagate jade plants). Otherwise, if the stem of the plant is fairly firm and the soil is bone dry, then it probably needs more moisture/humidity. Water it more often and try misting it on a regular basis. One other thing to check for is bugs on the plant, take a close look at the stems and leaf joints to make sure you don’t see any scale, mealy bugs or mites. I don’t recommend trimming a plant that’s already stressed out. It’s best to try to figure out why the leaves are dropping before you trim the plant. Thank you for the amazingly detailed post! I would walk halfway across the country right now for a jade cutting or two. I’ve been waiting to buy a jade plant, but have 9 kids and finances aren’t allowing for it. Maybe one day, I’ll join the jade plant club. Til then, I look forward to reading more posts. You’re welcome! 🙂 I’m glad you enjoyed it and I hope you find a jade plant cutting sometime soon! Bethany Cousins, if you know anyone with a jade plant, ask for a cutting or two. If you live anywhere near Topeka, KS, I would be glad to give you plenty! Love the jade plant…and every succulent and of course cactus….tropical houseplant get boring done tropical for over 25 years…but succulents I love there strange growth patterns….two of the same kind can grow so different. ….just a comment that I know jade plants absolutely love….lots of air movement…living in the desert they just grow big and beautiful with are very low humidity. …..
I’m with you, I love succulents the most too! 🙂 Thanks for sharing your tips. I would love to have a clipping of your Jade plant. What would you like in return ? I live in Wis. I’m Diane. i didn’t expect jade plants grow like a tree…from my browsing i came to appreciate more of it and i b’ve bought one already with flowers but didn’t repot due to strong rainfall from day 1 july until now.., worried all bout it..
thank you for column that teaches and inspires me more. I Am dead plant lover, still a beginner truly appreciate the beauty having one or more at home. Yes, jade plants can get pretty big. They grow like shrubs in California! I am a huge plant love too! Awesome, love the history of your jade plant. What a wonderful plant! My jade has begun to turn brown around the edges of the leaves and fall off. Some of the smaller leaves turn brown then completely dry up and fall off. Reading this article I may be watering it too often. But they almost look like sonlmeone has held a match to the edges of the leaves and they are burning off. It was looking so pretty in the spring w/the red edged leaves now it’s spragly. One thing I did do in the spring was repot it. What could be causing this? Humm… It sounds more like the plant isn’t getting enough humidity or it might be suffering from fertilizer burn. Jade plants like dry feet, but high humidity around the plant. If you think this might be the problem, you can mist it a few times a week or put a humidifier near the plant. Otherwise, do you fertilize the plant? If so, then I would definitely take a break from that and see if the problem goes away. Wow, over 100 years old?! That’s fantastic! They are great plants. Yes, flowering is good, that means you’re doing a great job caring for it and it’s rewarding you! Mine is flowering too for the first time (I’ve had mine for about 13 years). I’m so excited!! Hi can some one give me advice on my jade plants I have two good growing jade’s both just about 2 feet plus smaller ones in the pot from a foot upwards the problem was when I repotted my two plants I have 6 inches of soil then my jade’s are on top again 6 inches I watered them both and for 2-3 months I watered them to much one had holes in the bottom of pot the other didn’t and the soil was damp for 2-4 months. I took them out and put dry soil in could this have caused root rot I checked some of the roots and they were white and hard the smaller roots were weak I don’t have mushy or soft stems and the plants look great but there was small or thin roots that were brown and week but the thick roots are white and strong can someone please give advice.. many thanks. Oh no, good thing you noticed they were being overwatered! It sounds like your jades are still healthy. If they were rotting, they would have a mushy base/stem. Keep an eye on them and make sure to let the rootball dry out before watering them again. Thank you very much I opened one part of the root ball and scrapped away part of an other and the roots were white.l have done what you said and not watered any plant the part of the root ball are still damp but the dry soil is soaking it up I lost the mother plant because of this I only have a small bit of the mother trunk left 4 inches I have let it dry for a few days and waiting for root hormone to be delivered plus I have 9 cuts in small pots.. but thank you for advice as I was panicking and thought I have done it again I will keep an eye on them as you advised.. Ged..
Could you please advise me on without me sounding stupid would it help if I scrapped an inch or two of the soil away to get the Base of the stem and parts of the healthy roots to put root hormone on my jade plants for the damage that I did cause from the over watering. Would it help any or not. Great question. No, that won’t help. As long as the roots are white and the base of the plant isn’t mushy, I would just leave it alone for now and keep an eye on it until it dries out. It’s also a good idea to grow jade plants in a terracotta pot to lessen the chance of overwatering. Terracotta will wick the water away from the soil to help it dry out faster, so you’re less likely to overwater in the future. Good luck! You can post photos on my Facebook page here… Get Busy Gardening on Facebook. I have a 7 year old jade plant. It Stands about 18 inches from dirt and has a thick trunk. The plant was growing wide and taking up too much space. So I have tied branches together and having them grow into each other so they grow upright. Similar to the bamboo twist. Any suggestions on getting your plant to grow straight up? Are the branches drooping, or just growing wider than you like? You can always prune it to shape it. Great information – Jade trees are so amazing by themselves and they really can make a room pop. I’ve never really been much for houseplants, I seem to forget about them once spring and summer arrive. Thanks for the info it’s something to think about, a little green indoors would be a good thing. I loved my Jade plant, unfortunately I had to leave it behind when we moved across country! It was huge! I love jade plants, and we are very fortunate to have our side hill covered in a jade forest that the previous owners must have planted decades ago. You are right that they don’t need much water. We rarely, if ever, water them and they are thriving. They are in bloom right now, hundred of tiny white flowers, and it’s beautiful. Thank you for al the tips and suggestions. I’ve wondered why our jade plants don’t get red on the tips, and it must be because they are on a north-facing slope. I will have to try planting a few in a sunnier location. That sounds amazing! You are so lucky to be able to grow them outside in the landscape! Yes, it would be fun to see how differently they grow in full sun, jade plants do prefer the sun. Mine just flowered for me this year for the first time ever. There were only a few flowers, but it was so cool to see them blooming indoors like that! Hi, I have a jade plant that I grew from a leaf, it is now about 2 foot tall. It sits on my kitchen window, that is south facing and was fine until a few months ago. I have noticed that it is covered in black spots, any ideas? It has been very cold this winter, could this be a problem? I would hate to loose it, I have started a few new ones just in case, but really want to save this one. I suspect that you might be overwatering your jade plant. Jade plants need hardly any water during the cool winter months, and overwatering them during this time is one of the main causes of black spots on jade plants (I water my large jade plant maybe 2-3 times through the entire winter). Allow the soil to dry out completely before you water the plant again. Also, be sure the pot you’re using has drainage holes and allow it to drain completely each time you water – never allow the plant to sit in water. Also, take a close look at the plant to be sure it doesn’t have any bugs. Bugs could also cause black spots on jades. Be sure to look under the leaves and in the leaf joints. I have been taking cuttings from my Jade plant for Agee years now and I must have 40 or more. I have the luxury of living in Northern California where I can plant them outside in the ground. In the 40 years that I have grown Jade plants, I have never had a problem with one rotting as you describe. However, succulents in general often react to overwatering, bad soil and not enough light by rotting. When they reach a certain point, you can’t bring them back except by taking cuttings. Always allow the soil of your jade plants to dry out between waterings. The reason for this is the roots of Jade plants and most succulents need air to reach their roots. This can only happen if the soil dries out. You can add sand to your soil so water will pass through it faster also. Instead of fertilizing my plants I have a compost bin which supplies me with enough compost to mix into the soil of my Jade plants. Wow, I didn’t realize you could grow jade plants outside year round in NC! That’s awesome! Thanks for so much good information on Jade plants and watering. I think i have been watering my Jade plant too much and the plant is sitting in a another planter without drain holes. There are leaves that are burning off. I contributed this to too much direct heat. 1. How much heat is too much for jade plants, i live in Bay Area, CA and heat in summer can get to 100 FH. 2. Can the plant be left in direct heat? 3. How much cold is too much? Cold here can be as low as 30 FH. 4. Can i plant it in the ground and cover it during winter to protect from cold? I see that Terry has successfully planted in the ground and would love to understand how she is able to do that. It sounds like maybe you move your jade plant into the house during the winter, and then grow it outside during the summer? If that’s the case, then you have to make sure to move it into the sun gradually or the leaves will burn. Once it’s used to being in the sun, then it should be kept growing in full sun. Jade plants love sun and heat. 1. Jade plants can take the heat, I’ve seen them growing as shrubs in Southern CA, and areas of NV and AZ during my travels. 3. As for the cold, they are hardy down to zone 9a, so they can take a bit of cold. 4. Yes. As I said, they are grown as landscaping shrubs in other areas of CA. 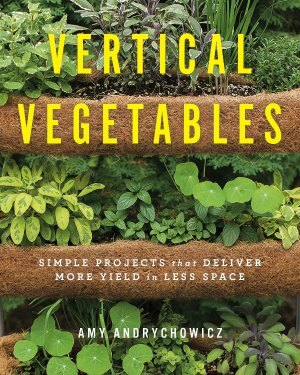 So, if you live in an area that is in growing zone 9a or higher, then you can plant them in your garden (just be sure to acclimate them to the full sun (i.e. : harden them off) before you plant them in your garden). Hi. I have an e.t. finger jade plant that is turning yellow at the bottom and then brown then that part will fall off. I let it dry out between waterings. There is a drain hole in the bottom of the pot, it gets plenty of sunlight inside (it has been 95-100 degrees here all summer so I don’t put it outside). Any tips to help? Thanks and may God bless. When you say it’s turning yellow at the bottom, do you mean the base of the plant or the bottom of the leaves? Check the stem to make sure it’s not soft. Thanks a lot for uploading such nice tips. I am new to gardening, so i really dont know how to take care of plants. Recently i fell in love with growing succulents at home and i bought one jade plant and also one gollum. I used to water them once week and that was when i realised that the jade plant had started shedding its leaves and the roots were rotting. My mother suggested me to repot it and reduce watering. I did that and the leaves still keep shedding drastically. I live in dubai and its summer here. I keep my plants in my living room near my balcony so that my plants get ample indirect sunlight. I dont keeo them outside because the heat is not bearable at all. Now my jade plant has just 2-3 leaves left and i feel very desperate.i just spray some water once in 3-4 days. And i was also trying to propogate these leaves as told above but they turned out to be a flop.may be because i have gone wrong somewhere.please do give a suggestion asap. Oh no, sorry to hear that your jade plant isn’t doing well. Check the stem of the plant to see if it’s mushy. If it’s mushy, that means it’s probably rotting and can’t be saved. Also, you won’t be able to propagate the cuttings if they are already rotting. 🙁 Take some cuttings and see if the stem is green inside. If it is, you might be able to propagate it. Just make sure to allow the cutting to cure (dry out) for a few days before trying to propagate it. Don’t water the cutting at all until you see signs of new growth. (you can mist it once and a while, but at most once a week). Good luck, hope your plant will survive! I have a jade plant grown from a single leaf about a year ago. It is doing beautifully EXCEPT a grasshopper got into the house and chewed a hunk out of several leaves. The grasshopper was exactly the same color as the leaves so we didn’t see it right away. Should I prune off the entire leaves that were chewed or just trim the damaged part off? The grasshopper just took a hunk out of a leaf and moved to another leaf. Unless the damaged leaves are showing signs of rot, you can just leave them on the plant. The wounds will heal, and if the leaf is damaged too much, the plant will drop it naturally. But, if it’s bothering you, then for sure you can trim it off (as long as the plant as lots of other healthy leaves). The great thing about trimming jade plants is that they will branch out again at the spot where you trimmed them, making the plant look fuller and more compact. Mom had a very old Jade plant that bloomed small white blooms once a year, I think just after Christmas each year. I have small plants now thanks for the tips. Awesome! Mine have bloomed a few times, but it’s never been covered with blooms. Do you know what she did to get it to bloom every year? Please Amy can u tell me if the jade plant is a succulent or a cactus? Keep up the good work! And good luck! I have been very lucky with my jade plant. I got it years ago as a small plant and kept repotting it. Now it is in a large pot and is huge. I never knew how to care for it. Now that I know I will be a better caretaker. I haven’t seen a jade plant since I left Hawaii. These grow pretty easily there and was a plant that a lot of people had. Hi! Thanks for the post! I have never had a jade plant bloom. I have several of them I can’t wait to give it a try this year! Hi I live in the North East of the country. I have always grown Jade plants indoors. 2 years ago my plants looked horrible, one of them died, I think I probably overwatered it. So I moved the pot outside in the winter, with the intention to throw it when I planted my herbs. To my surprise some of the leaves that had fallen off the plant started to grow. Some that had fell on the deck, to my surprise actually had roots, several leaves and small new leaves. Now this was in the spring after the snow had melted. SO I transplanted it with the plant that was still alive and set it outside for the spring through late fall. My plant not only grew included those leaves that fell off on the surviving plant and (I just stick them back into the dirt) it is healthy and beautiful. I do bring it in if we are supposed to get heavy rains. Come spring my plant goes back out onto the deck. When I transplant I mix a little sand with potting soil for more drainage. Works for me. Awesome! How exciting that your jade plant decided it wasn’t quite ready to die yet. LOL! Thanks for sharing your story and your tips. Oh, my deck gets east light and some early south light and it seems to love it. Like I said it works for me and my beautiful Jade. My Jade plant is dying. I don’t know what to do. Can u please guide me to save the plant. Sorry to hear your jade plant is sick. Can you give details of what’s wrong with it? I recently got a jade plant that is the miniature type you wrote about. It’s stems are a bright red color and some leaves are turning red on the underside. Is this good or bad? That’s great! 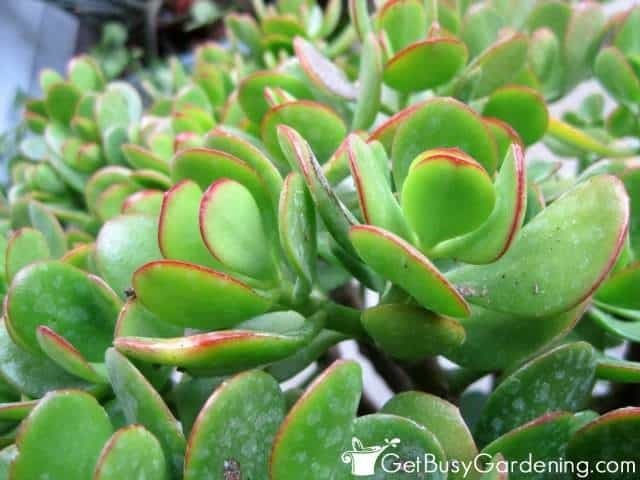 When jade plant leaves turn red, it means the plant is happy and getting plenty of sun. Enjoy the beauty of the red leaves. Is it still good if the actual stems are red? As long as the plant looks healthy, and the stems and leaves are firm, then all is good. I’ve never noticed the stems on my jade plant turning red, but you might have a different variety than I do. The red you see on your jade plant is like a sun tan rather than a sun burn. It protects the jade from burning in direct sunlight. Be sure to acclimate your jades to the sun gradually over a few weeks. Start under a shade tree and gradually move outward. If you have no shade trees. A small umbrella works great. Hello! I have learned a lot of problems/solutions/suggestions/info from my fellow succulent lovers especially jade plants by reading all their comments. I am a beginner to the succulent world and I want to thank you because it seems that you are the only one by far who respond to the questions succulent lovers ask. In fact I am saving this page. I attended a tutorial on growing succulents and there was not much about jade plants.A big THANK YOU from my tropical country, the Philippines. Wow, you’re welcome! Thanks for taking the time to leave such a nice complement. 🙂 Good luck with your jade plants, I hope they will grow very well for you! I really some help with my jade plants. Bascially they are growing very large and heavy. They are hitting around 1.5m in height. The pots are becoming to small. The plants keep breakong because they becoming heavy. We have 4 large plants. Would you recommend any types of spray to keep the plants healthy. What so we do if we cannot find larger pots to replant? It sounds to me like your plants are already extremely healthy, so you don’t need to spray them with anything. Do you live in a climate where it’s warm enough to plant them outside in the ground? If not, then I would recommend pruning your jade plant to keep it at your ideal size. You can prune it down to the size you want it, and then pinch out the new growth regularly to keep it compact. After you prune it, you can propagate the cuttings and give them away to friends. Here’s how to propagate jade plant cuttings. I bought both CRASSULA OVATA, AND GOLLUM but unfortunately both trees are dying i dont know why both jade are suffering .. I never over watered but still i dont know why they are dying .. Problems: Ovata’s leaves become dry and black and also its branches . same happens with gollum leafs are look like dry, then black ..
what is the peoblem ? It sounds to me like your jade plants are getting too much water. When you say your jade leaves are turning black and falling off, that sounds like rot to me. I would check the soil to make sure it’s not wet. Stick your finger down into the soil as far as you can to see if you feel any moisture. You can also slide the plants out of their pots and check the soil that way too (which is sometimes the best way to make sure the soil isn’t too wet). If you find the soil is wet, then you can leave them out of their pots to help it dry out faster. Do jade plants like to be crowded in a pot or have lots of room in a larger pot? Thanks! They aren’t picky about space. I’ve had my large jade plant growing in the same pot for probably 10 years or so, and I also have a few jades that have lots of room in their pots. Hi. I’ve no idea how old this post is, but maybe you can help? My jade plants are fine at the top but the lower leaves have gone a funny colour then they rot and drop off. They aren’t over-watered, although I didn’t know to water from the top as most plants get watered from the bottom. Should I start again? And if so, should it be with new plants rather than cuttings from these? The first thing to do is check the stem to see if it’s rotting. If the stem is mushy, that’s why the leaves are rotting and falling off. It sounds like you’re talking about cuttings that you’re trying to propagate? If that’s the case and the stem is mushy, then you’ll have to start over with new cuttings. Here’s a post I wrote with detailed steps for propagating jade plants from cuttings. And, you don’t *need* to water jade plants from the top, but it makes it easier to ensure you’re not overwatering them. When you water plants from the bottom, the top layer of soil tends to stay dryer so it’s harder to tell when the soil is actually dried out, or if the rootball is still wet. I have a large jade plant that I moved outside for the summer. We have had a very wet summer her in upstate NY and it keeps getting rained on. It’s planted in succulent soil in a plastic pot with several drainage holes. Is it bad to put a plastic leaf bag over it when it’s pouring? It’s too heavy to move in and out of the house but it keeps raining and I’m worried about it. I keep draping this bag over it but when I take the bag off, the bag has an odor that is quite strong. I’m not sure if it’s bad for the plant to do this. If it’s raining more than usual this summer, I would move the jade plant inside early for the winter, and let it dry out completely before giving it any more water. But, if your plant is in a full sun location, and gets a few days to dry out between rain storms, then it will probably be fine (as long as the pot has plenty of drainage). As for your plastic bag trick… I would be careful with that. You might end up holding in too much moisture, which can cause fungal issues on the leaves. If you can, I recommend putting your jade plant into a clay pot rather than a plastic pot. That will help the soil dry out faster, and lower the risk of overwatering. Any tips on keeping your cat out of the Jade plant? My cat loves to chew on plants so I have to be careful about what I bring in the house. Yes, I have a cat that likes to chew on plants too (especially when I tell her NO! LOL!). I use bitter apple spray, and cats hate it. It’s cured her of chewing on cords, shoes and other stuff around the house. Disclaimer though… I’ve never tried it on my jade plant before, so I would recommend that you spray a few leaves to test and make sure it doesn’t damage the plant before spraying the whole thing. I’ve used it on a few of my other plants without any problems. Good luck! I had a huge jade plant for about 40 years I planted it higher in the pot to expose the roots and trimmed it back as a bonsai. when we moved house it got put away in the back of a cupboard I assumed it had been lost or stolen. when I eventually found it ,it had been in the dark without water for 18 months. The soil in the pot had shrunk to nothing and the plant had dropped all its leaves. It looked like a piece of drift wood. I presumed it was dead but had become quite attached to it so I put it in a bucket of water with a brick on it to hold it down for a day then repotted it. in less than a week it was covered in buds and it recovered in just a short while. That year it flowered the only time I have ever seen it flower hundreds of tiny white five pointed flowers. Crassulas are desert plants and sometimes get no rain or water for very long periods but a year and a half!! WOW! That is an amazing story! I’m so glad to hear your jade plant recovered, I was so sad when you said you presumed it was dead. Amazing! Hi Amy, thank you for all the great info. I have a mini jade plant that I keep indoors in my apartment. It did not get enough sunlight in the beginning and a bunch of leaves started coming off. I bought a grow light and it got a little better but now the tree and branches are wrinkly and pruning. There are practically no leaves and branches are still slowly falling. I only water it like once a week (soil is dry). The grow light is anywhere from 2-6 inches away from the plant. I’m not sure what else I can do. I just want it to be healthy again. I have some pictures but I’m not sure how to send them. Any help would be great. THANKS! Lack of light won’t cause the leaves to shrivel and drop. The way you’re describing the stems and leaves, it sounds like the plant is either not getting enough water, or it is dying because the base is rotten and your jade plant can’t get any nutrients. Watering a jade plant once a week sounds like a lot. 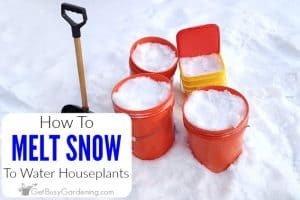 I don’t even water my small plants in 4″ pots that often during the winter. I’m worried that your jade plant may have been overwatered, and the base is rotting. Check all along the main stem of the plant to see if any of it is mushy. 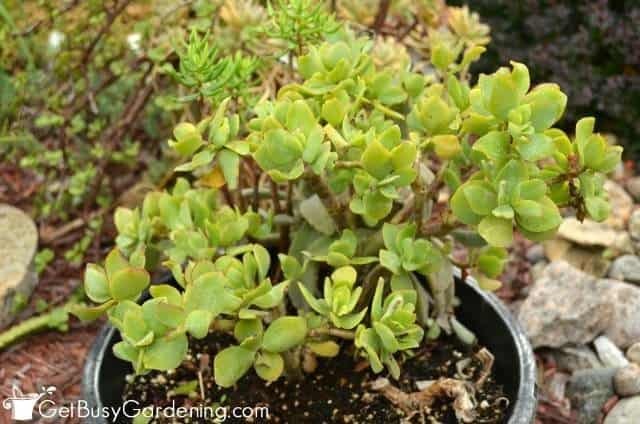 If so, then you’ll have to take healthy cuttings and propagate them to save your plant (here’s how to propagate jade plant cuttings). When you check the soil, be sure to stick your finger an inch into the soil. Sometimes the top layer can be completely dry, but the soil underneath is still wet. Otherwise, if the stem is pretty firm and seems healthy, then maybe it’s not getting enough water after all. If that’s the case, then I would look at potting it up into a larger container so that the soil won’t dry out so quickly. I water my large jade plant a couple of times all winter long, and my 4″ jades about once a month (if that) to give you an idea. My jade plant is dying it has lost all its leaves and I hope I can save it taking your advice. Definitely check the stem of the plant, all the way down to the soil. 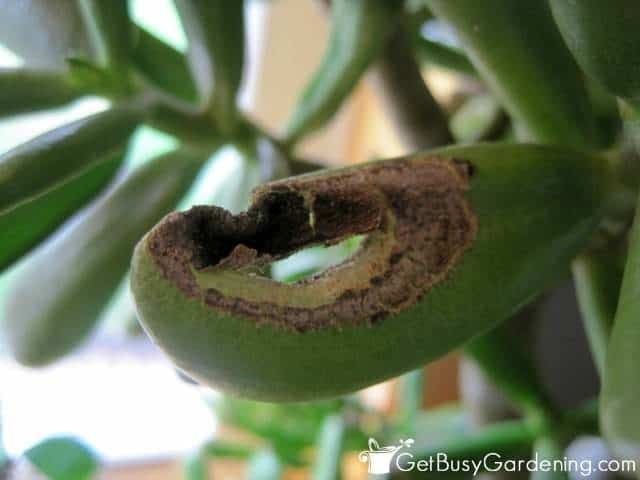 If it’s mushy or hollow, then you’ll need to take healthy cuttings to propagate because the rot will only spread and end up killing the entire plant. Overwatering is the number one killer of jade plants. But if the entire stem feels firm and healthy, then you may need to give it more water through the winter months. I hope you’ll be able to save your jade plant! I have a 25+ year old jade plant that’s huge. A couple years ago, it developed some reddish brown spots and stickiness/sap that actually drops on the floor around it. There doesn’t appear to be any bugs. I’ve tried completely pruning it back to the main stems, and it grows out but again develops this condition. Any suggestions? I would definitely keep an eye out for bugs, that is usually the only reason jade plant leaves are sticky like you describe. The reddish brown spots you describe sounds like houseplant scale to me. They don’t look like bugs at all, they just look like weird spots or bumps on the plant. Keep in mind that these houseplant pests start out very tiny, and you usually won’t even notice them until the population grows very large. Here’s info about scale insects, along with detailed information about how to get rid of them. Wow! Amy, your site is absolutely fascinating! I couldn’t stop reading all the questions and your very informative replies! I was given a Jade plant recently which I’m told was originally in the soil and was pulled out and neglected. A very kind neighbour nurtured it back to health and potted it for me. He DID tell me to water it twice a week and also he gave me home-made fertiliser which he said to use once a week!! The stem is very thick so I’m assuming it’s pretty old and it seems to now be flourishing on my balcony in Sydney. I’m so glad I found your site to show me how to look after it properly. Thanks again! Awe, thanks! I’m so glad you’re enjoying my website. 🙂 You’re welcome for the tips, I’m so glad that I could help you care for your jade plant. Hello, I have two baby crassula ovata plants in a 3.5 inches deep pot. I adopted it recently (no previous gardening experience but found it left behind) and followed instructions from your post on watering and light. It has now started looking healthy, sprouting new leaves with red rim and its happy and beautiful! Thank you! Now it has 6-8 leaves, the stem is green but healthy. At what point should I re-pot it into a bigger pot? P.S: I live n Sweden and it is still winter. Wonderful, I’m so glad that you were able to revive your jade plants using my tips! That’s so great to hear! The best time to repot jade plants is in the spring, so I would recommend waiting until early spring. Great! I will do that. Thank you very much! Your website is wonderful! Hi! I just bought a mini indoor jade plant and the seller told me to put it outside for sunlight once a week. But you said that it needs a lot of sunlight. How many hours should I let it be under the sun? And how many times per week? Thank hank you! I do not recommend moving your jade plant outdoors once a week. If you take a jade plant that’s used to growing indoors and put it outside into the direct sun, it will burn the leaves and can cause major damage to your plant. I would either grow it indoors year round, or put it outside during the entire summer (slowly moving it into the sun) then bring it indoors during the winter. Once they are used to being outside in full sun, they can stay in the full sun all day long. If you’re growing it indoors, then you can either put it in a sunny window, or add a grow light and keep that on for 8-12 hours a day. I have a jade tree an it eas doing good till I set it outside an it got colder that night than I thought. Then 2 days later almost all the leaves feel off. There is still sine small ones an the trunk is still solid. What would cause that an week it grow the leaves back? It sounds like the cold is what caused your jade plant to drop most of it’s leaves. 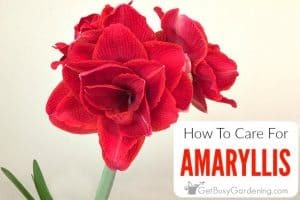 Check the tips of the stems to make sure they are still firm and healthy, and prune off any mushy tips or branches (that means they were probably frozen, and will only die). As long as the stems and the trunk are still firm, then your jade plant will grow back. Advice.I have a gollum jade plant that I’ve had for approx 5 years. I have kept it in the house until recently when it had out grown the pot it was in and was dropping to the side. I’ve never overwatered it. This is the third repotting since I bought it. This time I left it outside to get more sun due to the drooping. Not mushy, not overwatered, not underwatered, the tubal leaves are plump. But it is still drooping. Is there something I am missing? I may just be that your jade plant is so large and top heavy, it’s drooping under it’s own weight. Have you ever pruned it? That might be something you want to try this spring. Hello, thank you for this incredible post. I found the link as I was googling how to clean my little jade. She has gotten quite dusty, and although I use Safer brand cleaning spray on some of my succulents with great results, I did read that I should never spray jade. Well, it doesn’t really need any Safer soap — it’s just dusty, and as summer is coming I’m hoping it will come out of dormancy and get some new growth. Your post didn’t give me an answer to the question of dust, but it did give me lots of other great info and I’ve ordered items that you recommended for succlent care — I got the moisture sensor, some succulent food, and some turface. I have been struggling with getting the soil just right for my succulents, and some have died as a result. It’s very daunting. But when the turface arrives I’m going to try your DIY soil recipe. 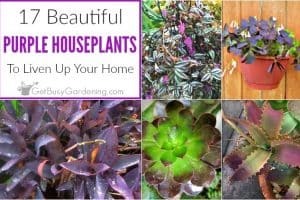 If you are stil catching comments for this post and are reading this could you let me know how I might go about dusting off my plant without having to use too much water? Thanks! Oh no, sorry to hear about your jade! Jade plants can be very sensitive to sprays. I would recommend just leaving it alone to recover. Don’t move it, don’t prune it, and definitely do not fertilize it. Once it starts to put on healthy new growth, then you can prune off the old damaged leaves. If the pests ever show up again, definitely test any future sprays you use on a few leaves before spraying the whole plant (I would recommend that for any type of plant). Good luck, I hope Oliver will recover quickly. This was a really helpful and thorough article, thank you. I am taking over care of my mother’s jade plants after she passed away and this sets everything out very well for a beginner. Awesome, glad you found my jade plant guide helpful! 🙂 Enjoy your jade plants. Hi Amy, you are the “jade Dr.” I so enjoy all of your helpful posts. I have a jade that is getting big round black spots on a few leaves, only on the top, not the bottom..Its not rot, and everything else looks quite healthy. They are in the north window. A shade tree has grown do much over the summer that the plant only gets A few hours of good sun. Could this be the problem..not enough sunlight? Also, I keep a sprayer full of pure alcohol on hand and all the jades get a good misting about once a month to prevent scale..works great! I just don’t do it in the hot sun as that would burn them! If the black spots on your jade plant aren’t rot, then it could be damage caused by bugs or from a previous sunburn (if you ever put it outside). Jade plants need a lot of light, so definitely move it to a sunnier window or add a grow light. I will just grow leggy in your north facing window. Definitely let your jade plant dry out. The fact that fungus is growing on it tells me it’s getting way too much moisture. I would move it to a spot that has better air circulation and where your plant won’t get wet. your help I hope I can grow this little guy to reach for the sky. I will be visiting your site often. Will let you know how I’m doing. Have a great day. I was gifted a jade plant that looks like it was several cuttings placed in one pot. I have repotted it twice and it is growing well, but I am concerned that the plants have grown so thickly together that they are competing for sunlight and other respurces. I tried to see if I could pull them apart the last time I repotted them, but they are a pretty solid mass at this point and it would require a lot of cutting. I am afraid cutting them apart may hurt them, so I guess my question is, how likely is it the plants will be damaged by cutting them apart, and is it even worth it? Will their close proximity harm them, or should I just leave them as they are? Cutting the jade plants apart shouldn’t hurt them. They can be rooted at any point on the stem. So even if each of the stems don’t have roots after you separate them, you can propagate them. (Here’s how to propagate jade cuttings) However, growing multiple jade plants in one pot isn’t a big deal, and they should continue to grow just fine. If they are too crowded, you can transplant them into a larger pot. If they’re growing leggy, then prune them to keep the plants compact. Wow, sounds like you have a very happy jade plant on your hands! Whether you choose to prune it or leave it to continue growing larger is really up to you. If it’s so heavy that it’s falling apart like you describe, then it would be better to prune it back to prevent it from splitting more. They can be pruned back hard. 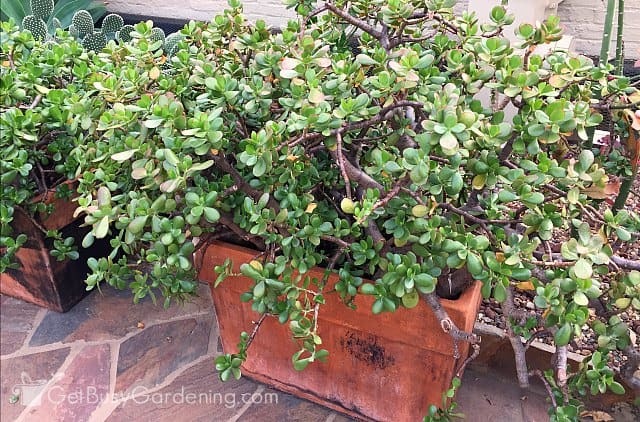 Pruning it will keep your jade more compact, so the branches don’t grow so large and heavy. Simply nicking the skin won’t produce any new growth, but your jade might end up growing roots out of the wound if it’s close to the ground. Otherwise, the wound would just heal over. Is there anyway to promote a leggy Jade to grow more sense? Mine is about 8 years old and was in low light in my last house. I now have a great South facing window. Promote new growth on the stems (fairly thick and woody)? Yes, you can pinch off the new growth at the very top of the branches to encourage more branching. Otherwise, for a very leggy jade plant, you can prune it back to promote bushy new growth. Jade plants can be pruned back pretty hard. I would wait until spring to prune it. I have had a jade plant a few times throughout my life. The first one lived great with hardly any care at all and routine watering. The last jade I had the leaves all dropped off then some of its large branches as I believe I must have watered it too much or maybe there wasn’t enough light or both. The jade I have currently was out of a succulent garden I purchased 2 years ago. When winter came I kept in the pool house for the winter. Last fall I separated it from the succulent garden into its own pot and brought it in the house for the winter in front of a window that gets a lot of early day light. I’ve noticed a white/grey fuzz mould like film started to cover the tops of the leaves about 2 months ago. It wipes off. I have not read anything in your or anyone else’s posts about this film on the leaves. this also happened to my last large jade plant before and during it dropping it’s leaves. Could this be a sign of root rot? I’ve been trying not to over water it but didn’t realise it prefers pretty dry soil. The pot its in does not have drainage holes either. What do you think? I don’t want to loose another Jade. Oh no, sorry to hear about your struggles with growing jade plants. Yes, the mildew growing on the leaves could be a sign that it’s getting too much water and/or humidity. However, take a close look at that to make sure it’s not actually mealybugs. Jades do like dry soil, especially during the winter. I water my large jade plant maybe 2-3 times all winter long, and that’t it. I would definitely recommend allowing the soil to dry completely before watering it. I would also recommend repotting it into a container that has drainage holes, especially if you ever put your plant outside. Good luck! I have a beautiful Jade that I keep in our sunroom all year long. At this time of year I always struggle as her yellowing, shriveled leaves start falling off. This tells me she needs water but when I touch the soil it feels moist so I tend to wait to water while I continue to watch more leaves fall off. It is a fairly large plant. I wanted to send pictures but I don’t see a way to do that. I’m wondering if the water is just not reaching the bottom of the plant. Measuring from the floor up she is a little over three feet high, and she measures about 4 feet wide and has lots of leaves – most plump and shiny and there is always new growth and this year in particular she has been adding more leaves along the stem.. We repotted her last year. The pot is 14” in diameter and 10” high. I’m not much of a gardener but I have done well with this plant and want to be sure it continues to thrive. When we purchased her she was flowering (which has never happened again) and we were told that these plants don’t flower until they are about 25 years old and we have had her for about 15 years. My jade plant does the same thing about this time of the year. Several months of dry winter indoor air causes the leaves to turn brown and drop off. I don’t get too worried about it myself. It grows back beautifully as soon as I move it back outside in the spring. As for the watering, you can stick your finger an inch into the soil to check to see how wet it is (A soil moisture gauge also comes in handy for this). Once the soil is completely dry, water it again until the water starts coming out of the bottom drainage holes. That way you know it’s getting a deep watering. I’m not sure where you heard about the flowering, but jade plants don’t need to be a certain age to flower. Flowering is trigger by light, watering, and temperature, and jades can flower every year in the right conditions. See the section above called “Jade Plant Flowers” for more details. 15inches tall and has no branches. It is tall and straight, with a pair of leaves nearly every one inch–not very beautiful. Is there a way to encourage it to branch out and become more bushy? Thanks for your reply. Yes, you can prune your jade plant to get it to branch out and grow bushier. 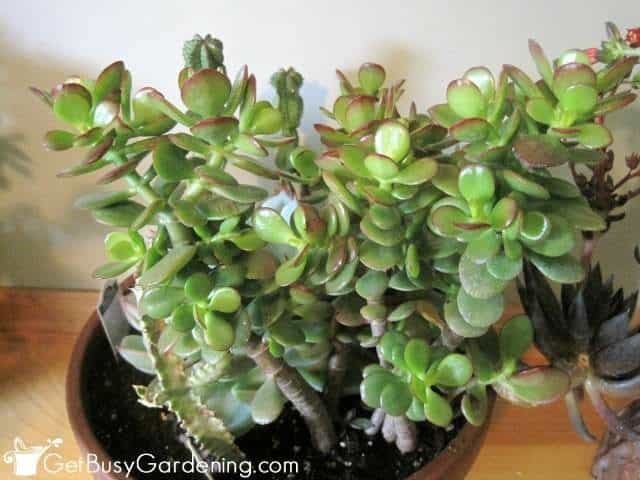 Read the “Jade Plant Pruning” section above for more details.